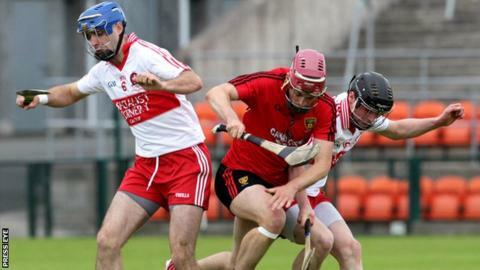 Holders Down, Derry and Armagh all begin their 2014 hurling championship campaigns on Saturday when they have their opening Christy Ring Cup games. Down face Meath in their opener at Navan [14:30 BST] while Derry will be action against competition favourites Kerry at Tralee [13:00]. Armagh, meanwhile, take on Mayo at Castlebar [14:30]. Fintan Conway is ruled out for Down by suspension but Michael Ennis and James Coyle are available again. As was the case during the recent Hurling League, Gerard Monan's Down team must head into the Ring Cup campaign minus the services of long-serving attackers Paul Braniff and Gareth Johnson. Braniff has opted out of this season's action while Johnson was ruled out for the rest of the year after sustaining a knee injury in Kehoe Cup game in January. Despite the absence of the influential duo, Down won all their round-robin games in Division 2B of the League but a heartbreaking defeat by a Wicklow side in the divisional decider means that the Mourne County will again play in 2B next season. Down had already beaten the Garden County in one of their round-robin matches. Monan's side will be boosted by the return of Ennis and Coyle after injury but the manager will be without Conway following his dismissal in the Wicklow game which saw him being handed a three-match ban. However, Meath go into the game under something of a cloud after manager Cillian Farrell and selector Kevin Dowd were both dismissed from the positions early this week before being reinstated. Farrell is currently serving an eight-week suspension with Dowd in the middle of a four-week ban following incidents during the league game against Down in March. The duo were relieved of their positions by the county board only to be reinstated at Wednesday's county board meeting. Neither will be allowed on the sideline or dressing-room on Saturday so another selector Nick Fitzgerald take charge of the team. Derry boss Ger Rogan names youngster Brian Og McGilligan at midfield for the clash with the holders in Tralee. Brothers Liam and Kevin Hinphey will fill the central defensive roles while goalkeeper Darrell McDermott is available after missing the closing stages of the league. Full-back Conor Quinn has to be content with a place on the bench after being bothered by injury in recent weeks. Derry: D McDermott; M Warnock, L Hinphey, E McGuckin; P Cleary, K Hinphey, A Rafferty; B Og McGilligan, T McCloskey; C McQuillan, A Grant, A Kelly; J O'Dwyer, R Convery, O McCloskey. Subs: B Robinson, R McCloskey, M O'Hagan, C Convery, T McCloy, C Quinn, D O'Neill, N Farren, S Farren, B Rogers, S McFerran.